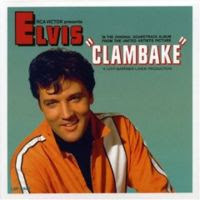 Elvis Today: Gonna have a clambake! In my latest posting one of the comments was from a guy who just like me has a blog about Elvis. The blog is called Have A Clambake! and I found it very enjoyable. Together with a friend (they go by the pen names Mike Edwards and Vince Everett, no less) he writes about experiences when it comes to Elvis, movies he’s seen, records he’s been listening to and so on. Why don't you check it out yourself. I especially like the name that inspired the blog's name, and share Mike Edwards feelings when it comes to the movie Clambake. I also like this film, even if it's one of Elvis worst. Maybe it has to do with the fact that it's one of the first ones I saw, maybe it's because Bill Bixby also starred in The Incredible Hulk which I thought was pretty cool at the time, maybe the answer is Shelley Fabares or maybe it's the fact that the film is so bad it actually becomes funny. Of course the music could have something to do with it. I've always liked the soundtrack, especially the beautiful "You Don’t Know Me" but also "Hey, Hey, Hey" which is a pretty funky tune despite silly lyrics. There are also a lot of good bonus songs such as "Guitar Man" and "Big Boss Man." Before I sign off I have to mention the awful "Confidence" number where Elvis sings to get a girl to slide down a helter-skelter. This is without doubt one of the worst scenes Elvis ever did, but there's a funny part in it. One of the children is a boy dressed in blue who is pushed out of the way by Elvis and then looks pretty sour for the rest of the scene. Priceless! Poor production values aside, I like the movie Clambake. "Confidence" is one of my favourite scenes of Elvis singing with children! Yeah, that's right! I remember sitting on the bus hearing a girl behind me talking to a friend about this cool Elvis movie she'd seen that she'd borrowed from someone. Turned out that someone was my brother and that the movie was Clambake. It's a small world! Or at least a small community! :-) I think this, together with Tickle Me, is one of the funnier Elvis movies. But, and I'm sorry eiramenna, I think the Confidence scene is horrible! Almost as out of place as the merry-go-round scene in Change of Habit.